The Hough Graduate School of Business, part of the University of Florida’s Warrington College of Business, was officially named after William R. Hough, who donated $30 million to the college of 2007. Hough was part of the original MBA class at the University of Florida in 1948. The Warrington College of Business at the University of Florida houses the Heavener School of Business for undergraduate business students, as well as the Fisher School of Accounting. The Hough Graduate School of Business is located at the northeast corner of the University of Florida campus in Gainesville, just south of the central Warrington College of Business building. The school is located about five miles southwest of the Gainesville Regional Airport. William R. Hough Hall, named after the same William R. Hough in which the graduate school of business is named after, officially opened in 2010. The 70,000-square foot facility features state-of-the-art classrooms, interpersonal career development and counseling centers, academic and recruitment offices, as well as study rooms, a small area for dining, and the Financial Markets Laboratory on the third floor. There are currently 30 instructional faculty members teaching in the Online MBA programs at Hough, with 26 working full-time and four working part-time. Approximately 16 of these faculty members are tenured or tenure-track, and have been teaching online programs for an average of eight years. 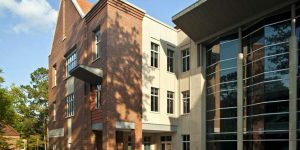 The Hough Graduate School of Business offers a traditional full-time MBA program, as well as a one-year and two-year part-time and a traditional Online MBA, an Executive MBA, and a Professional MBA in South Florida. There are numerous dual MBA degree program options available.